One of the joys of a used bookstore is discovering wonderful books you would never think to read or new genres you would never explore. While I have long been a fan of history (evidenced by the fact that we own a 149 year old train station), I have not generally picked up”history” books for pleasure reading. They are not the types of books that one grabs on a cold winter’s night, to be read while sipping hot chocolate or a hot buttered rum. This fall, however, I have discovered that a great many “history” books are as entertaining as a good Agatha Christie or as gripping as Robert Ludlum. Most are not about great people. Indeed, the most gripping are about the everyday sorts rather than Presidents or Kings or decorated Generals. They tell a specific story rather than providing an overview of dates and times and places. 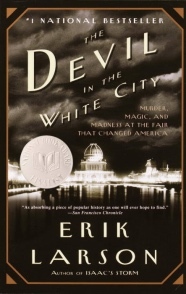 The Devil in the White City: Murder, Magic, and Madness at the Fair that Changed America by Eric Larson. In 1893, Chicago hosted the Columbian Exposition (the Chicago World’s Fair), a fair designed by Daniel Burnham and Frederick Law Olmstead to celebrate American innovation and progress (as well as good taste); it also unknowingly hosted a serial killer who used the Fair to find his victims. The meticulously researched book reads like a suspense novel. 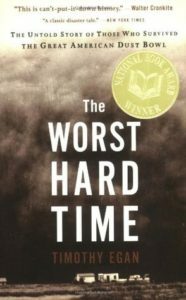 International Horror Guild Award for Nonfiction (2003); National Book Award Finalist (2003); CWA Gold Dagger Award (2003), and the list goes on. Keeping with the historical theme, our author of the week is Studs Terkel (1912-2008). In 1985, Terkel, a oral historian and writer, won the Pulitzer Prize for The Good War, an oral history of World War II. Over the course of a 50 year career, Terkel wrote 18 books, including Hard Times, a history of the Great Depression; Working, a study of what folks do for living and what they think about their jobs; and Will the Circle be Unbroken: Reflections on Death, Rebirth, and Hunger for a Faith. What set Terkel’s histories apart was his focus on the ordinary, on the every day. rather than the great voices and the famous faces. He learned about history by listening to the people who put one foot in front of the other and survived even the most difficult of times. 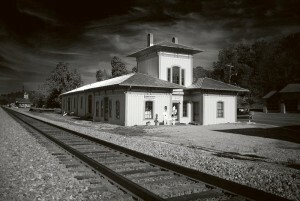 Mark your calendar now for the 611. The Roanoke Transportation Museum and the rail historical folks are sponsoring Roanoke to Walton excursions on May 27, 28, and 29th–over Memorial Day Weekend. We are busy working on creating a community festival to coincide with this year’s excursion. Check back at this site or on the historiccambria.com site for updates as we get closer. Book Talk, Our "Weekly Reader"